WB39 - Simon Hill's day boat Ruach, in Queensland, Australia. 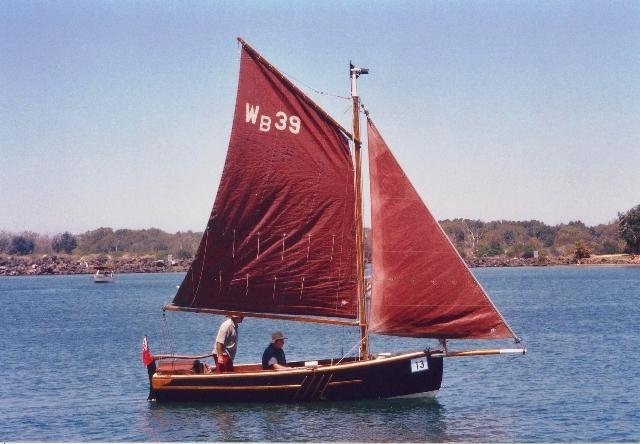 My Winkle Brig 39 was built by Eric for my father (Barrie Hill) who moored and used the boat during the summer (both days!!) in the little harbour of West Bay on the Dorset coast. I understand that she was the first WB to be built on this hull plan as an open day boat. My father commissioned her this way as he was a keen amateur fisherman and wanted more room on board to his crab pots etc. I have been told that since this open boat there have been a number of others built to this plan since. I think David may have this info. 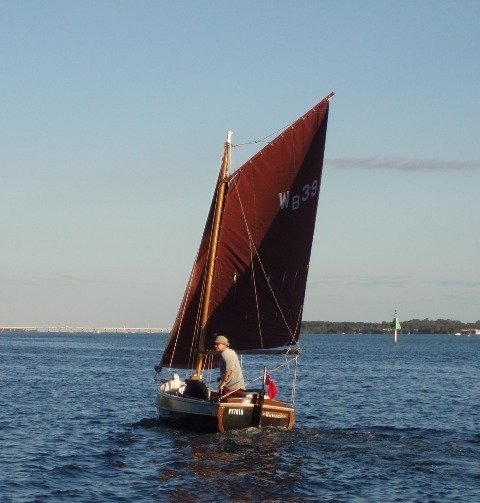 After taking possession of the boat Dad made a few modifications, including adding a roller reefing jib mechanism, painting the hull black, fitting an echo sounder, and having a local boatbuilder add a heavy steel rubbing strake to the keel and hardwood rubbing stakes around the hull and gunwale and to the aft quarters to protect her when she was on the tidal for and aft mooring. Dad use her for a few seasons (more than ten - but I will have to check the original invoice for the exact amount). When he was diagnosed with terminal cancer 4 years ago he asked me if I would like his boat. The bequest included shipping to Australia on the trailer in a container. It cost as much to get it through quarantine and customs and off the dock in Brisbane as it did to send it half way around the world - but fortunately I was not paying. So now I think she is the only one down under. I have since renamed her (she was called 'NICOLA JANE' and is now 'RUWACH' which is Hebrew for wind/Spirit) and have made some further modifications.